“The way of architecture is the quiet voice that underlies it and has guided it from the beginning” Arthur Erickson. Well the plan was to go to Lagoa and find the lovely main church which according to the pictures had an amazing interior. Cameras at the ready…. but not for the first time we found the church doors locked. So if anyone can comment on the blog as to how you get into a locked church – apart from when there is a service on (!) please let me know! I knew I should have asked my last employers for a ‘letter of introduction’ to the Catholic church in Portugal! There are so many beautiful interiors and so much history there waiting to be explored… and so many photos waiting to be taken. 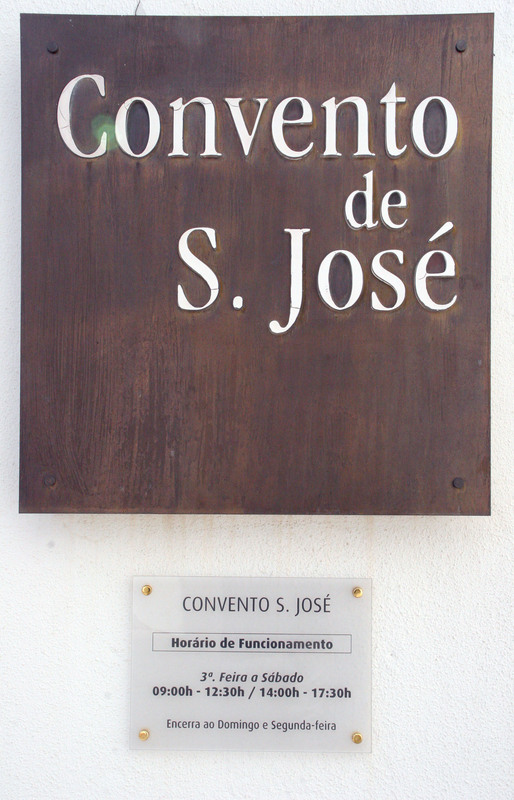 But we ended up finding a real treat instead – the Convento de São José (Convent of Saint Joseph) almost round the corner from the main church on the main road north to Silves. The guide said that it is the city’s cultural centre and hosts exhibitions of painting, photography, sculpture and pottery – and that it opens Tues – Sat 9-12.30 and 2-5.30. 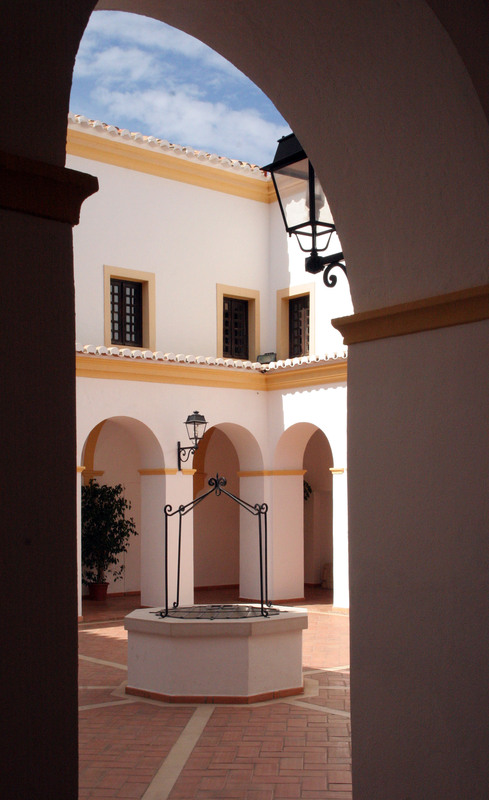 We wandered into the courtyard half expecting to be shooed away, it was very quiet – so we went up the main steps and into a reception with a very friendly welcome from a nice lady – ‘yes we are open – and yes you can take photographs’. She then switched all the lights on for us – and you got the feeling you were going to be the only visitors that day. You walk around in a square inside and each of the old nun’s rooms have been turned into information areas for the local area – some of the displays gave us ideas for more trips out. But what was much more interesting was the rooms themselves – lovingly restored and very peaceful – with amazing light and all overlooking the cloisters in the centre. The original building was seriously damaged in the 1755 Earthquake and was rebuilt. 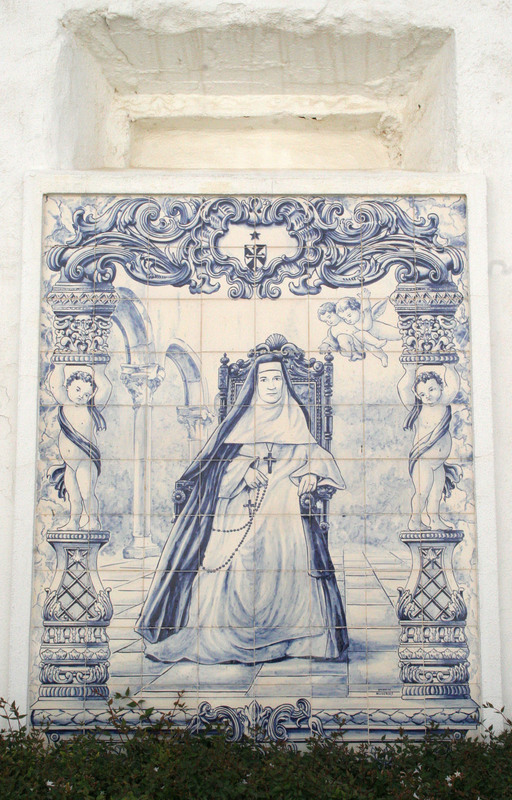 In 1834 the government of Portugal suppressed all religious orders and monastic houses in the country. The institution continued to function as a foster home, probably as an “Association of Poor Girls”. In 1876, after church-state relations had been more or less normalized, the convent was re-opened as a girl’s school by a number of Third Order Dominican Sisters. 1910, there was a formal separation of church and state under which the state took over all educational functions and the Convent was closed. In 1924 the building and grounds were purchased by the town of Lagoa which used it as a primary school up until the 1970s when a new purpose-built school was opened. 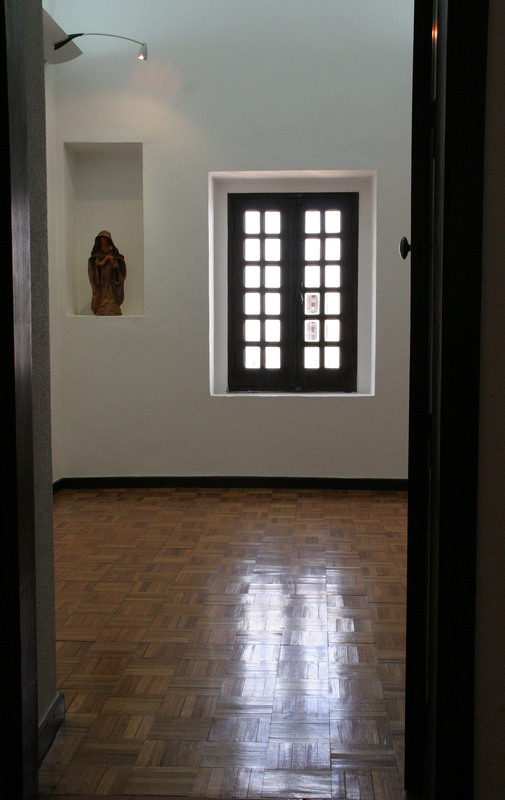 At various times space in the convent was used for public offices and the chapel was used as the Civil Registry Office up to about 1940 after which it was restored and used for religious services until 1974 due to reduced attendance numbers. 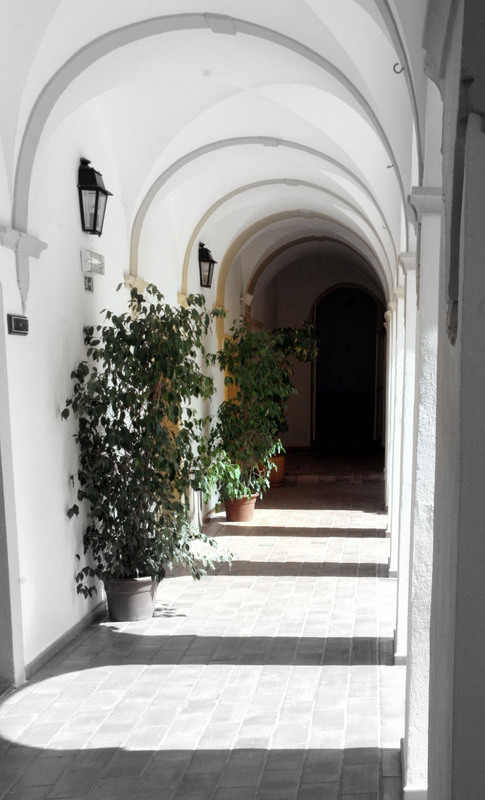 Walking around in such a peaceful area you felt that you could almost touch the history and imagine nuns gliding past you. I’ve never been one for retreats (I tried one once and lasted an hour – I’m too much of a chatterer!) but standing there enjoying the sunshine and quiet I almost envied a way of life that is so much simpler and ordered with a sense of space and a slowing of the clock that almost forced you to slow down and breathe a bit deeper and slower. There’s a lovely little Chapel and many of the rooms around the cloister have been opened up and converted into exhibition rooms, and there’s even an auditorium. One of the rooms had a modern art exhibition – and we found out there’s an almost permanent series of exhibitions there which seem to change every 6-8 weeks. It was a fabulous light and airy space for an art exhibition (I’ve got my eye on it!) and a real treat. A menhir (French, from: men, stone + hir, long) is a large upright standing stone. Menhirs may be found singly as monoliths or as part of a group of similar stones. Their size can vary considerably; but their shape is generally uneven and squared, often tapering towards the top. The function of Menhirs has apparently provoked much debate. Over the centuries they have variously been thought to have been used by Druids for human sacrifice, used as territorial markers or elements of a complex ideological system, or functioned as early calendars. It seems incongruous that a place so peaceful and calm would have such history attached to it – and bizarrely this juxtaposition of a potential Druid human sacrificial stone; alongside a “foundling wheel” for saving unwanted babies; and a convent of nuns. Well you can’t say that religion hasn’t been in the thick of it there! “Finding some quiet time in your life, I think, is hugely important”. So I am sure we will go back again – to see the next art exhibition planned – and also to try again to get into the maddeningly locked church round the corner! This entry was posted in Algarve, Places to Visit and tagged art, churches, Culture, days out, Lagoa. Bookmark the permalink. 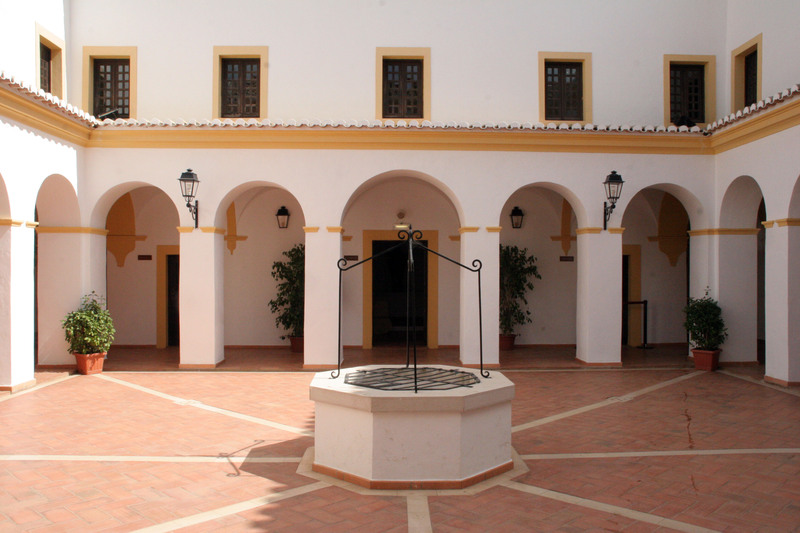 Although I have visited the Algarve many, many times I don´t think I had ever gone to the trouble of visiting churches or convents, so it´s nice that you wrote so beautifully about this lovely convent, and lovely photos too. Sometimes as an outsider you get to “see” more of the place where you reside that someone who lives there, isn´t that strange? Since I have been living in Perth, I have got to know more of it whenever I show visitors around. Hi thanks for your comments and glad you liked the post – I think we have seen more of the tucked away things since being here this time – I think that having our cameras with us – and a blog to write! has definitely helped us to see different things and places with fresh eyes…. Know exactly where you’re at with this. Tavira has 20 plus churches and I still haven’t managed to get inside them all. My whoop of joy can probably be heard at your end of the Algarve when I find one open. I did a guide for Simonseeks on churches and cake shops. Really enjoyed the research!